In just 8 days, my kids’ summer break will come to an end and they’ll head back to school. Summer just flew by way too quickly… I’m embarrassed to say we haven’t even begun our back to school shopping, yet, and I am NOT looking forward to the dent it’s going to put in our already-stretched-thin budget. Thankfully, I’ve got more than a few years of back to school shopping under my belt, so I’ve learned some pretty good strategies for saving money along the way. I’m guessing many of you could use a little help stretching your Back to School budgets, so I thought I’d share my tried and true tactics, starting with the all-important prep work! Make a list — If you create a list and stick to it, you’re going to ensure that you get everything you need in one trip. This is especially helpful if you have several students, as I do. Combine all of their lists into one master list, and you’ll save yourself a huge headache. Take inventory — Every year my kids come home at the end of the school year with bags of unused glue sticks, pencils, erasers, scissors, etc. Don’t let these items go to waste; take them into consideration when making your list for this year. Likely you’ll find many of these items listed once again. Do your homework — Gather up those current sales ads and see what the prices are like this week so you can plan your trip accordingly. If you prefer to shop in stores, these tips are for you. But by all means, do the prep work above first to get the most for your money! Buy discounted gift cards before you go — Once you’ve decided where to shop, check a site like Raise.com to purchase gift cards for that store at significant savings. Save even more by using the referral code dseeking during registration to receive a $5 credit, and use SAVE5 when checking out for another $5 off a $25 purchase. That’s a total of $10 in FREE cash toward your supplies, plus the savings from the discount gift card! Save on gas — Utilize price matching so you’re not running all over town. Carry all of your ads into a store and have that store meet the advertised prices. Don’t forget your coupons — More and more schools are asking parents to supply classroom items outside the traditional school supplies. Items on our list include things like hand sanitizer, Clorox Wipes, Kleenex, and Ziploc Bags. 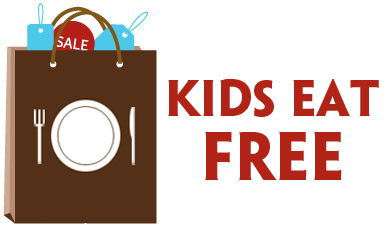 You’ll find coupons available for all of these items in the Deal Seeking Mom Coupon Database. Save your receipts — Many stores will refund the difference if the price of an item you purchased drops within 14 days. Keep the receipts in an envelope in your purse, so you have them handy if you notice a markdown or sale at a later date. Just don’t feel like fighting the crowds this year? I can’t say that I blame you. Luckily, now is a better time than ever to consider shopping online for school supplies and clothing! Let me show you how to save big using a $50 online Kmart purchase as an example. Buy discounted gift cards before you go — As I mentioned before, checking a site like Raise.com to purchase gift cards can yield significant savings. Save even more by using the referral code dseeking when creating your account to receive a $5 credit, and use SAVE5 when checking out for another $5 off a $25 purchase. Right now, you can purchase Kmart gift cards for use in stores or online up to 4.2% off. So using a $50 Kmart gift card priced at 4% off as an example, you can purchase it for as low as $38 if you use the referral code and promo code above, cutting $12 off your purchase right from the start! Shop through a cashback site — Start off your purchase by shopping through your favorite cash back site. For Kmart, in particular, you can earn up to 6% cash back depending on which site you choose. On a $50 purchase, that’s an additional $3 in savings. Search for promo codes before checking out — Do a quick Google search for the store name + “coupons” or “promo code” to find extra savings. 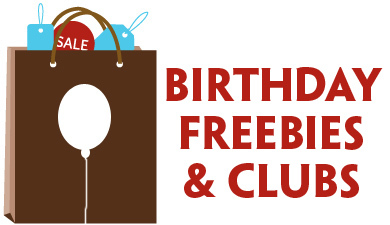 Typically you can at least find a free shipping code, but many times you’ll find money off or gift with purchase codes, as well. Kmart actually does some of the work for you, listing some available offers clearly at the top of their site. For example, right now you automatically get free shipping on a purchase of $35 or more. 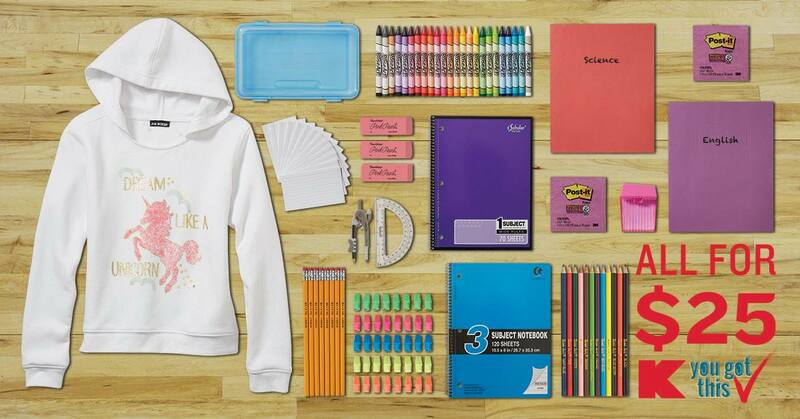 There’s also an offer for Shop Your Way members to get $10 back in point when you spend $35 on Back to School items. And when I did a search for “Kmart promo code”, I found another code for $5 off a $45 purchase. Combine them all, and that’s another $15+ in savings! And don’t forget you’re saving on gas, too. All together, this equals a total savings of more than $30!!! Not too shabby for about 5 minutes worth of work. Am I right?! And of course you can use these same strategies to save at any store you like, AND they work beyond Back to School shopping. Discounted gift cards are one of my favorite ways to save year round! Win a $150 Kmart gift card from Raise.com! How would you like to win a $150 Kmart gift card? I want to help one of YOU stretch your Back to School shopping budget even further with this awesome giveaway. To enter to win, just comment below to let me know what back to school deals you’re still searching for that could benefit from a Raise.com gift card. I’ll choose a winner from all of the entries submitted! Disclosure: Sponsored by Raise.com, all opinions are my own. Thank you for supporting the brands that support this site! Browsing the beauty and hair care aisle(s) at stores can be almost overwhelming these days. Crowded shelves and the sheer number of products can mean spending way more time scanning and staring than necessary — time that could be spent doing other (presumably more important) tasks. Kroger and Unilever are pairing up to cut the time that it takes you to find and choose the hair care products that will help you get the style you desire! No more settling on products that don’t meet your needs or leaving the aisle empty handed… You’ll find video tutorials and in-store styling cards, using your favorite Unilever products that fit you, your style and your confidence, every time you go Krogering. 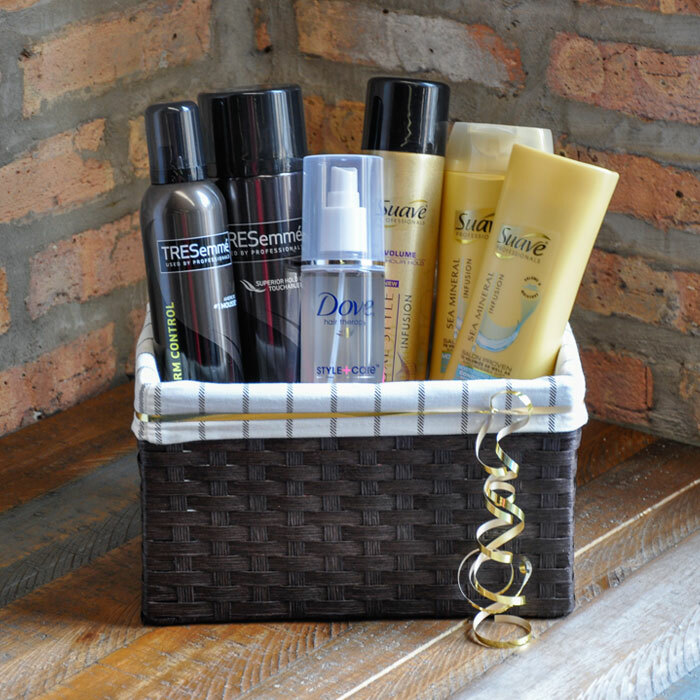 Buy 3 participating TRESemme, Dove, or Suave hair products, Receive $3.00 off next shopping trip. Win a Unilever Prize Pack + $25 Kroger Gift Card! How would you like to win a Unilever Prize Pack that includes a selection of TRESemme, Dove and Suave hair care products, plus a $25 Kroger gift card?!? Just head over to the Deal Seeking Mom Facebook page through Wednesday, August 3, 2016 at 11:59 pm CT to enter — one lucky reader will win! 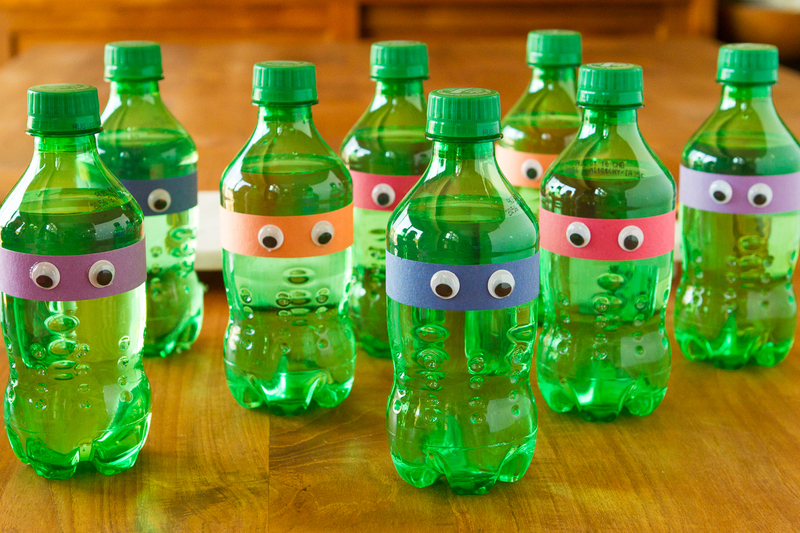 If your little one is a big fan of Teenage Mutant Ninja Turtles, you’re going to LOVE this quick and easy idea for TMNT drinks! They’re perfect for parties, after sports snacks, or just for no special reason at all, because they’re really simple to make. 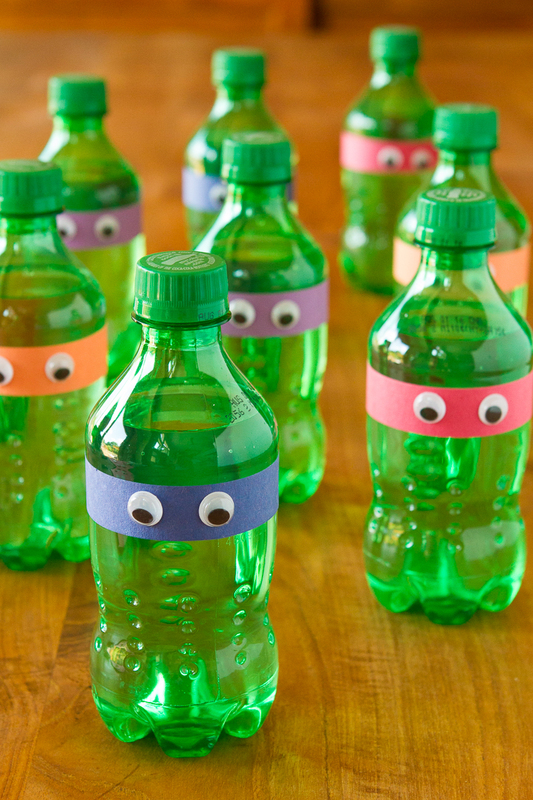 I’ve seen these cute Teenage Mutant Ninja Turtles bottles done before with felt for the masks, but I want to super simplify it, so I cut colored strips of orange, red, blue and purple sheets of construction paper instead. Measurements for each strip should be 8″ long by 3/4″ wide. Simply remove the labels from any soda beverage that comes in a green plastic bottle. Tape the colored strips around each bottle, and then using either hot glue or craft glue, add two google eyes on top of each of the “masks”. Easy-peasy and SO cute!!! You know what pairs perfectly with these drinks? 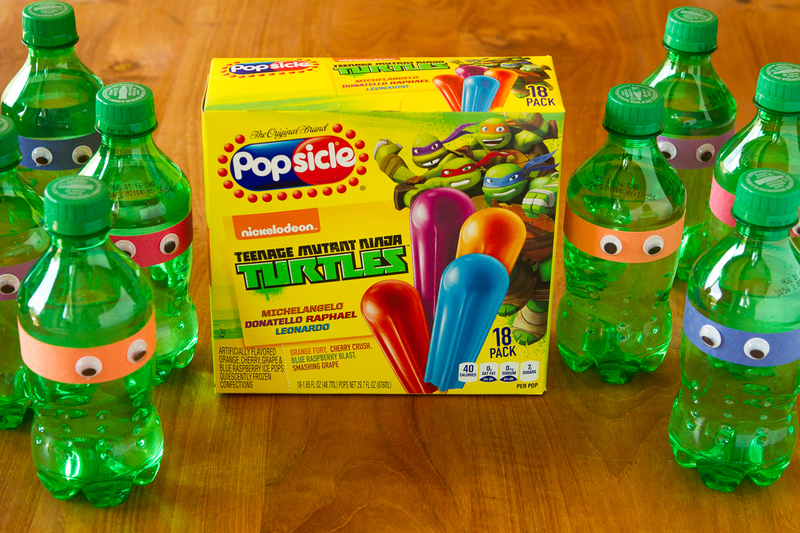 Teenage Mutant Ninja Popsicles! Of course, my kids love pretty much any kind of popsicles… But these come in their favorite fruity flavors, AND they’re on sale at Target right now at 2 for $7. 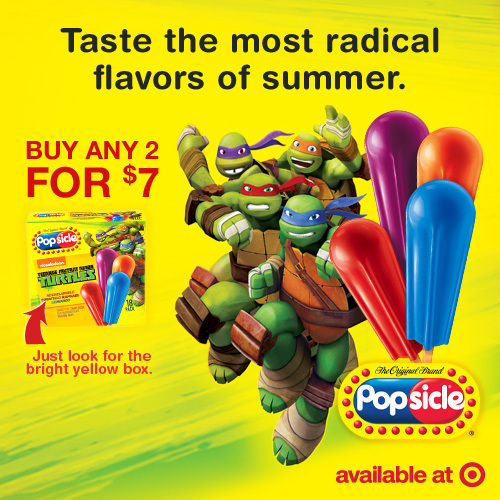 Add a box or two of these Teenage Mutant Ninja Turtles Popsicles to your cart at Target, along with the supplies for these party drinks and you’ll be the coolest mom around! Together, they’re a party all on their own — I surprised my kids with them when they came home hot and sweaty from soccer camp yesterday, and their eyes went wide with excitement. Even my oldest daughter was thrilled to find this refreshing treat waiting. Although, I had to laugh when she asked if there was a pink turtle… Go figure, this girl is ALL about pink! 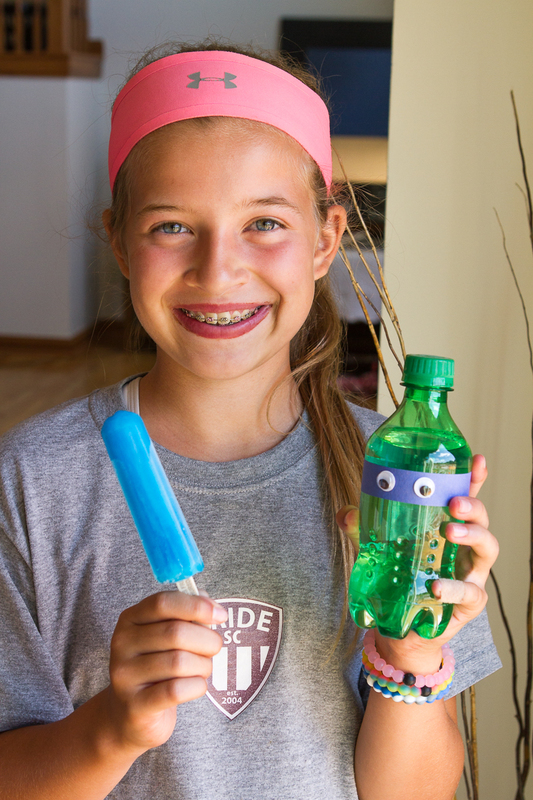 But she was more than happy to settle for the Blue Raspberry Blast Popsicle and a blue Leonardo drink instead. Win a TMNT Prize Pack! How would you like to win a TMNT Prize Pack that includes a $35 Fandango gift card and a $25 Target gift card?!? Just head over to the Deal Seeking Mom Facebook page through Saturday, July 16, 2016 at 11:59 pm ET to enter — one lucky reader will win! 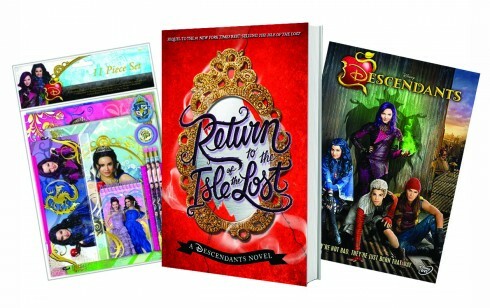 Are you the ultimate Descendants fan? 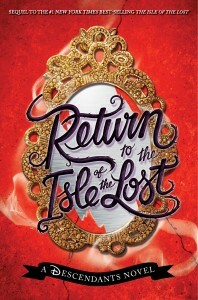 You’ll be excited about Return to Isle of the Lost, by Melissa de la Cruz, just in stores yesterday (5/24/16). plus a Descendants stationary set! To enter, share your Descendant’s fan’s favorite character. 1. Leave a comment. Share your Descendant’s fan’s favorite character. One (1) Disney Descendants Prize Pack, as described above. This giveaway ends at 2PM on Thursday, May 26, 2016 and is open to all U.S. residents 18 years or older. I’ll use And the Winner Is to select the winning comment. Winner will be notified by email and listed on my Giveaway Winners page. Winners must respond within 48 hours of notification to claim their prize. Good luck! Moms are there for it all — the good, the bad, the ugly-crying… They manage the good times and the bad, making it look effortless, almost like magic. While we just celebrated Mother’s Day recently, we really should be celebrating moms throughout the whole year. Right? Which is why Dove created special limited edition Dove Beauty Bars, available now at Meijer. Sporting words like “love”, “kind”, and “real care”, these products are sure to encourage and uplift even the most exhausted, hard-working mama… and her family, too! The secret to beautiful skin is every-day moisture, and no other bar hydrates skin better than Dove. With ¼ moisturizing cream, Dove Beauty Bar helps skin feel more firm and elastic when compared to ordinary soap. The inspiring words are just the icing on the cake! 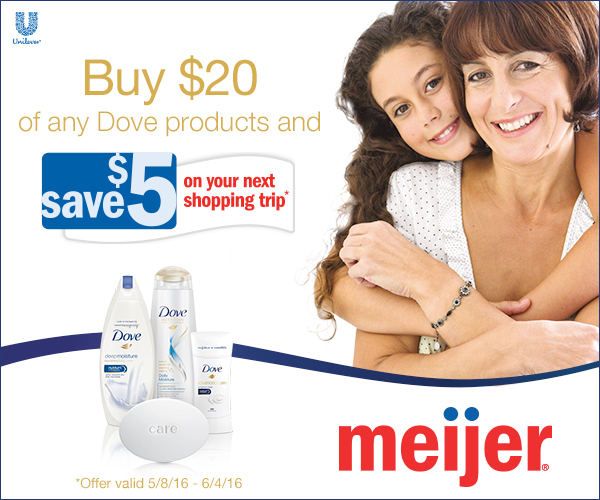 Win a $25 Meijer gift card! How would you like to win a $25 Meijer gift card? Just head over to the Deal Seeking Mom Facebook page through Tuesday, June 7, 2016 at 11:59 pm ET to enter — one lucky reader will win!